Break out the brandy, blue cheese and whipping cream! 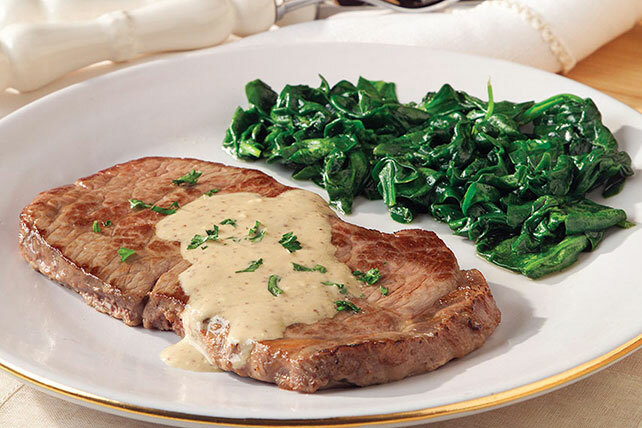 These ingredients combine to make a sauce that will seriously up your steak game! Add brandy to meat drippings in skillet; cook to deglaze skillet, stirring constantly to remove browned bits from bottom of skillet. Add beef broth; bring to boil. Reduce heat to medium-low; cook 3 to 5 min. or until broth mixture is slightly reduced, stirring constantly. Add cheese, cream and mustard; mix well. Cook until cheese is completely melted and mixture is well blended, stirring frequently. Balance this special-occasion entree with smart side dishes. For example, choose a mixed green salad and hot cooked vegetable. To deglaze a pan, a small amount of liquid is added to the pan drippings and cooked until the small flavorful bits of browned food are loosened from the bottom of the pan.